Women—and definitely kids—go through hair ties at an amazing rate. By Lilla hair ties turn plain elastic ties into fashion accessories you’ll be far less likely to lose. Match them up with different outfits, wear them in multiples, and combine them in ways that make a fashion statement. That was the goal of the Founders, Michelle Finvarb Possin and Colette Bakalarz Feldman. These active Miami women were tired of boring black hair ties. Their By Lilla elastics are affordable fashion accessories, designed to look like jewelry both in your hair and on your wrist. A beautiful way to keep your hair out of your face will always be on hand. Hello everyone! I'm proud to introduce By Lilla to The Grommet. I'd be happy to answer any questions you have! My niece recently developed an allergy to latex. Are these latex free? What does B F F mean? @Nancy BFF means Best Friends Forever!! Would these easily get caught in coarse hair? @Megan Hi Megan, It depends on the elastic and how you wear it. The discs should not get caught in your hair, as the small charms. On the hand if your hair is very coarse I would use the bigger charm elastics at end of a braid or in a bun. Hope this helps!! These are really pretty! How likely is it that the decorations will snag & pull my hair? I have waist-length hair, so when some is broken off by hair ties, it takes FOREVER to grow back out. Thanks! @Bethany Hi Bethany, It really depends on the thickness and texture of your hair. The discs should not get caught in your hair, as for the charms, I would use the bigger charm elastics at end of a braid or in a bun. Are the decorations removabel? I don't have an issue losing hair ties. My issue is I search to find unique ones but the elastic ends up giving way eventually. I have purchased some like these from Brighton and individual artists at over 20 dollars each but end up throwing out perfectly good heavy decorations when the elastic gives way. I still will buy yours because the price is very reasonable. Great idea for gifts plus some for myself of course! @Laura Hi Laura, The charms are removable, the discs are not unless you cut the elastic. Do these leave crinkle marks after wearing? Sure you know, some hair ties are especially made not to dent hair, so that you can wear them one day, and brush out later, without worrying about marks. Thanks. @Jean Hi Jean, these are softer than a regular elastics but are not specially made to not dent hair! I would love these for my daughter but she has a severe allergy to nickel even if there is an over coating of stainless steel, silver or gold. Is there any nickel in the charms? @Suzann Hi Suzann, unfortunately the metal piece that has the logo on it does have hints of nickel in it. Are your bracelets made in the USA, or assembled here? Hi Lynn, thanks for the question. 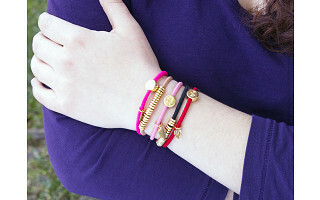 By Lilla bracelets are Made in the USA with foreign components. Hi Barbara, thanks for the comment! By Lilla is more of a fashion accessory than a medical alert bracelet. While I don't want to say they won't definitely ever get into that field, until they do, you should keep whatever your doctor gives you to let EMTs, firefighters, police officers, etc. know any conditions you may have. what design is on the metal discs? @Connie Hi Connie, There is no design, they are smooth. Women—and definitely kids—go through hair ties at an amazing rate. By Lilla hair ties turn plain elastic ties into fashion accessories you’ll be far less likely to lose. Match them up with different outfits, wear them in multiples, and combine them in ways that make a fashion statement. That was the goal of the Founders, Michelle Finvarb Possin and Colette Bakalarz Feldman. These active Miami women were tired of boring black hair ties.